Longer and lower than its predecessors, the new Kia Rio has a much sleeker and sporty appearance. The tiger nose grille, rounded design and clean and smooth edge are definitely some of the defining qualities of this vehicle. With a longer wheelbase, bonnet and front overhang and a lower roofline and compact back end the Rio is noticeably more muscular and stable. Sculpted, smooth and aerodynamic, the upgraded all-new Kia Rio boasts more ingenious design than ever before. The new, low, squat and athletic stance of the Rio gives it some newly found bold and striking looks, a look that is continued through into the smallest details. Adding new twists to its award-winning design, a noticeable update would be the more slender and wider ‘tiger-nose’ front grille, perfectly balanced with the bi-function headlights and d-shaped daytime runners. Kia has successfully refined an already popular design, giving it a more mature and sophisticated appearance. These smooth lines not only add to the overall appearance but also to the actual aerodynamics of the drive, but we’ll get into that later. The exterior is distinguished by its smooth and sculpted surfaces and its sharper lines, and depending on the model it is available in seven different colours. This smooth and easy-on-the-eye design continues on into the interior, a really well laid out and well-designed cabin space. The straight and smooth lines of the exterior are evident in the styling which whilst emphasising the space separates the controls up nicely. Matte finishes on contrasting colours and contouring of the trim give the Rio a really eye-catching and unique appearance, really different from the grey interiors of close competitors. Gloss finishes are a very aesthetically pleasing addition, and the centre console is dominated by a new touch screen infotainment display. The introduction of the touch screen means a reduction in the number of buttons and therefore makes for a much neater dashboard and tidy and uncluttered appearance! Increased leg and shoulder room is among some of the best in its class, the new proportions have also made a massive difference where the boot is concerned with a 13% increase in capacity! The boot is now 325 litres, with the seats up, a great size for you and all the family, the seat also have the welcome 60:40 split which will give way to a super generous 980 litres! The interior has been designed around the infotainment and connective technology. With additions such as the well placed and massively intuitive steering wheel controls the driver is always easily connected to the car. The designs inclusion of charging ports throughout the car are a really good example of how Kia have kept the passengers in mind with implementing tech features. The all-new Kia Rio is packed full of intuitive technology to help keep you safe, with a load of active and passive systems to help you along the way and give you the best driving experience. With a wide range of engines, Kia has something for everyone and some even come with the addition of Idle Stop and Go (ISG). Starting at Grade 1 the new Kia Rio is extremely well equipped and works it’s way up to the realms of luxurious by the time you reach First Addition. The Rio is undeniably characterised by its smooth and sculpted design, but this new sportier look is more than just a new appearance. The smoothness continues into the actual driving experience, the improved sculpting and aerodynamics have enhanced the quality of the drive as well as the fuel economy. A more rigid body shell and improved suspension deliver a much more captivating handling experience, add this to the reduced cabin noise and roomy cabin and you’ve got a real winner when it comes to an enjoyable ride. 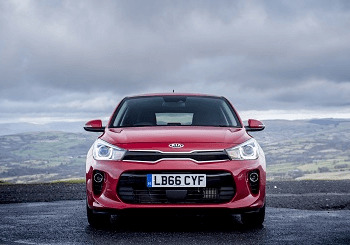 Kia has firmly acknowledged that one of their main priorities was to improve the driving experience and make it a key element of their new vehicle.